Howard Leight Leightning L3H Cap Mounted Earmuffs are designed to fit full brim North hardhats. These hearing protection ear muffs provide higher NRR's than North's hardhat model earmuffs do, but at a lower price-point. The Leightning L3H uses a modern hard hat clip that allows for quick and easy attachment to multiple models of North hard hats. Attaching the ear muffs to the hardhat is a snap. The clips also have a new face shield slot that allows North face shield visors to be connected as well, allowing for a complete, integrated head protection solution. The Leightning L3H features sleek ear cups with a contemporary design. This lets the user preserve good freedom of movement while wearing both ear protectors and head safety gear. The smooth, lower profile ear cups also collect less dirt, so the earmuffs stay cleaner for longer, improving hygiene. The cross-linked polyethylene foam ear pads improve comfort while also maintaining an effective seal against noise. The ear pads themselves are replaceable for efficient and inexpensive maintenance. Height adjustments ensure each worker can get a good, personalized fit, and the Quick-Click system keeps the ear cups properly adjusted throughout hours of wear. NRR 27 protection from hazardous noise makes these earmuffs appropriate for a wide variety of industrial applications in high-noise environments. Honeywell recommends them especially for the steel and metals, mining, forestry, and construction industries. 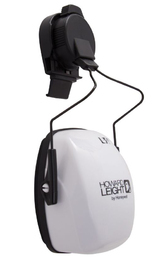 Howard Leight's patented Air Flow Control™ technology ensures the sound attenuation is always optimal. The L3H's attractive, contemporary design is backed by rugged steel construction, so these ear muffs can stand up to punishment in demanding work environments. These earmuffs are compatible with several models of North headgear, including the Peak Hard Hat, the K2 Hard Hat, and the Matterhorn Hard Hat. Also compatible with North Face Shields. The Leightning L3H requires Howard Leight hygiene kit no. 1012000. 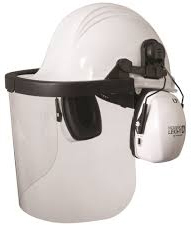 For a Howard Leight ear muff for regular North hard hats, see the Thunder T1H.